Check out these earthquake hazard maps. See our list of earthquake preparedness resources. Sound Seismic's own Leif Jackson will be teaching a 2 hour class at the Phinney Neighborhood Association on Tuesday, February 12th. It's only $25 ($20 for PNA members). Click on the link to register! Concrete drilling creates silica dust. Respirable Silica is considered to be "the new asbestos". Beginning October 2018, contractors are required to prevent airborne silica dust by using a very specifie set of tools, vacuums and attachments. Sound Seismic is fully compliant with requlations. As a result, your home will be cleaner, and your family will be safer. The emoji for volcanic eruptions has been getting a lot of exposure on Twitter and other social media in recent months, with Volcán de Fuego’s deadly blast in Guatemala and Kilauea’s continuing rampage on Hawaii’s Big Island. Other natural disasters, like tornadoes, cyclones and tsunamis also have emojis that communicate their essence at a glance. But there’s never been a universal image for the natural disaster that threatens a third of the world’s population: earthquakes. A small group of experts — including two from Washington state — is working to fill that gap with an open competition for an earth-shaking symbol that transcends language and culture. The northwest is reminded on Friday of how the Cascadia Subduction Zone – a fault that sits along the bottom of the Pacific Ocean stretching from Northern Vancouver Island to Northern California – could cause the worst natural disaster in the history of North America. It was 318 years ago it produced a magnitude 9 megathrust earthquake. Washington State Department of Resources wrote a blog post on Friday about the event. King5 News did a story on how homeowners have been motivated by a recent article to retrofit their homes. View the story online HERE. The largest, a magnitude 5.9 quake, struck just after 1 p.m. at a depth of 10 kilometers (or 6 miles). On Monday evening, quakes measuring 3.9 and 4.2 occurred. Paul Caruso with the U.S. Geological Survey says the quakes hit a fault west of the Oregon and Washington coast. They were about 330 miles west of Salem and 288 miles from Coos Bay Oregon. Caruso says they were 6 miles deep, which is relatively shallow. He says the deeper the quake, the less likely people will feel it. The magnitude 7.8 quake that recently struck Japan did little damage because it was 420 miles deep. Caruso says the quakes were not big enough to trigger tsunamis. He says it usually takes a magnitude 7 for that to happen. 314 years ago Sunday, a megathrust earthquake devastated the region … ready for another? Never missing the opportunity to scare the living daylights out of us, earthquake experts in Washington remind us that this past Sunday was the 314th anniversary of the last megathrust quake in the Cascadia Subduction Zone that would have wiped out a big part of Seattle and the infrastructure of the region had we all been there. And we are due for another one. Two years after Japan’s megaquake and tsunami, the country is still struggling to recover. Facing the same kind of disaster, the Pacific Northwest is looking at steps to take over the coming decades to ensure that a monster quake here won’t send the region into a permanent economic tailspin. (VANCOUVER, British Columbia) — A magnitude 7.7 earthquake struck off the west coast of Canada, but there were no reports of major damage. Residents in parts of British Columbia were evacuated, but the province appeared to escape the biggest quake in Canada since 1949 largely unscathed. The U.S. Geological Survey said the powerful temblor hit the Queen Charlotte Islands just after 8 p.m. local time Saturday at a depth of about 3 miles (5 kilometers) and was centered 96 miles (155 kilometers) south of Masset, British Columbia. It was felt across a wide area in British Columbia, both on its Pacific islands and on the mainland. Scientists are still unraveling last year's giant Tohoku earthquake and tsunami in Japan, and some of what they're finding doesn't bode well for the Pacific Northwest. BANDA ACEH, Indonesia (Reuters) - A powerful 8.6 magnitude earthquake and a series of strong aftershocks struck off Indonesia on Wednesday, sending people scurrying from buildings as far away as southern India, but there seemed little risk of a disastrous tsunami as in 2004. Indonesia said it was checking for damage and casualties but remarkably, no such reports had been received for several hours after the quakes, including in Aceh, the closest province and the area decimated by the disaster eight years ago. A 7.6-magnitude earthquake struck Mexico this afternoon, centered between Acapulco and Oaxaca, with no reported injuries. The quake's epicenter was about 115 miles east of Acapulco and 10 miles underground. Twelve months after the devastating Great East Japan Earthquake the world mourns the human toll, pays its respects and looks ahead to preventing another tragedy. President Obama marked the one-year anniversary of a massive earthquake and tsunami that devastated Japan and led to a nuclear meltdown at the Fukushima Daiichi nuclear power plant. In a statement Friday, Obama praised the “extraordinary fortitude” of the Japanese people and touted U.S. efforts to help the country recover from the disaster. The Cascadia subduction zone is the boundary where the Juan de Fuca plate dives beneath the North American plate. After last year's Japan megaquake, some scientists and emergency planners now wonder whether an earthquake along this zone could trigger a tsunami much larger than originally predicted. (Reuters) - A magnitude 5.7 earthquake struck off Vancouver Island on Saturday, some 209 miles west of Victoria, the capital of the Canadian province of British Columbia, the U.S. Geological Survey said. There was a report on the USGS website of the quake centered in the Pacific Ocean being felt in Vancouver, the largest city in British Columbia. The quake struck at 12:05 p.m. local time, the USGS said. There was no danger of a tsunami from the earthquake, and there have been no reports of damage, said seismologist Shengzao Chen of the USGS. JAKARTA, Indonesia (AP) – A powerful earthquake has hit waters of western Indonesia, prompting local officials to issue a tsunami warning. The U.S. Geological survey said the quake had a preliminary magnitude of 7.3 and struck 260 miles (420 kilometers) off the coast of Aceh province. It was centered 18 miles (30 kilometers) beneath the ocean floor. Arief Akhir, an official with Indonesia's geological agency, said a tsunami warning has been issued. Indonesia is prone to seismic upheaval due to its location on the Pacific "Ring of Fire," an arc of volcanos and fault lines encircling the Pacific Basin. A giant quake off the country on Dec. 26, 2004, triggered a tsunami in the Indian Ocean that killed 230,000 people, half of them in Aceh. Each year, Angie’s List honors companies that have achieved and maintained a superior service rating from our members with the Super Service Award. This is the highest honor given annually to companies by Angie's List, who have achieved and maintained a superior service rating on Angie's List throughout the past year. Sound Seismic and Jackson Remodeling are honored to have been recognized with this award. ISTANBUL — At least 240 people were killed and more than 1,000 were injured after a powerful earthquake shook eastern Turkey, Deputy Prime Minister Besir Atalay said on Monday. In a televised statement, Mr. Atalay said that rescue workers continued to search for survivors and reach the dead in and around the city of Van, close to Turkey’s eastern border with Iran. News agencies reported that up 270 people had died. More than 200 aftershocks shook the area throughout the night, the Turkish Seismic Institute said on Monday. In Ercis, a town about 30 miles from Van, more than 120 people were reported dead and in Van at least 100 people died after the 7.2 magnitude earthquake on Sunday. Around 350 injuries were reported in Van and more than 700 in Ercis and surrounding villages, the semi-official Anatolian Agency reported. Thousands of frightened residents spent the night in the streets, huddled around fires and wrapped in blankets and layers of clothing, television footage showed. Aid agencies throughout the country joined together to deliver blankets and warm clothing to the region where temperatures fall below freezing in early autumn. Despite news reports that many villages were left without assistance, Mr. Atalay said that relief supplies were distributed to all areas around Van. Around 7,000 tents were distributed in Van and another 5,000 in Ercis and field kitchens were available for up to 25,000, he said in a broadcast statement. Yalcin Akay, a resident of Ercis, was rescued from the rubble of a six-storey building after he contacted emergency workers on his cellphone and directed the teams to his location, Anatolian Agency reported. Video taken almost immediately after the earthquake showed hundreds of people in Van running through a cloud of smoke in one of the city’s main streets, crying and shouting in panic. As the full extent of the damage became clear, desperate survivors dug with bare hands into the collapsed steel and concrete, trying to rescue the trapped and the injured, various television channels showed. People used flashlights to search for survivors trapped under piles of rubble. Videos on television showed cranes working around some of the collapsed buildings, while aid workers periodically called for silence to try to detect signs of life under huge chunks of concrete. In Van, the walls of a prison collapsed, and about 200 inmates escaped, NTV reported; about 50 prisoners were later recaptured. More than 1,270 aid workers from 38 nearby towns were sent to Van and Ercis to help in the relief efforts, while other nations, including Israel, offered assistance. Israel’s offer came as a diplomatic standoff has virtually frozen relations between the two countries, in the aftermath of a raid that killed nine people by Israeli commandos last year trying to halt a Turkish aid flotilla bound for Gaza. Units of the Turkish Army were sent to the mountainous region in the east, and the Health Ministry assembled 145 ambulances and 500 staff members to help coordinate the medical operation, the Anatolian News Agency reported. The Turkish Red Crescent sent tents, blankets and other supplies to the area. Earthquakes take place frequently in Turkey, which is crisscrossed by fault lines, and both the government and the Red Crescent are expected to act more effectively in organizing rescue and relief operations. In 1999, thousands of people were killed by two powerful earthquakes in northwestern Turkey. “Tents will not be enough — we do not have food, no rescue teams have reached here yet,” said Serif Tarakci, an official from the village of Halkali, about 30 miles from the city of Van. “It’s cold at night, everybody is outside and we’re freezing here.” Temperatures in the region were about 34 degrees late on Sunday night. What If? Expo at Northgate Mall July 9, 2011. Fischer Broadcasting is hosting the first "What If?" Expo, this Saturday from 10-5. Disaster preparedness and response experts will be exhibiting and presenting. Visit Sound Seismic's table to discuss retrofitting with Leif or Erik. Or stop by the seminar stage at 3:30 to hear Leif talk about how our homes can be reinforced to resist earthquake damage. Sound Seismic Earthquakes Win Seattle Softball Championship! The Sound Seismic Earthquakes, of Queen Anne Little League, won the city softball championships 2-0 on Monday, June 13, 2011. The Quakes rallied from behind in two of their four tournament wins, showing their grit and determination. The championship game was a pitching duel, with SS getting two runs on only two hits, in support of starter Bella Jackson's no-hit shutout. Strengthening a residence through a home earthquake retrofit is as simple as ABC: anchor, brace and connect. Most homes built in the past 30 years or so do not need a retrofit to hold steady in earthquakes, but older homes may need some foundation tune-ups. If the foundation is not secured to the rest of the structure, major damage can result from the ground shaking. The earthquake in Japan — plus major temblors in New Zealand, Chile and Haiti in the past year — has renewed the focus on seismic safety at home. Series of big quakes mean more on the way? First came 2004's killer quake and tsunami off Sumatra. Then a year ago, Chile was rocked almost as hard. Now Japan is reeling from its biggest quake in recorded history. The juxtaposition of three of the world's most powerful earthquakes within a span of seven years has some scientists asking the question: Are we in an age of megaquakes? TOKYO — Japan’s government said the cost of the earthquake and tsunami that devastated the northeast could reach $309 billion, making it the world’s most expensive natural disaster on record. The extensive damage to housing, roads, utilities and businesses across seven prefectures has resulted in direct losses of between 16 trillion yen ($198 billion) and 25 trillion yen ($309 billion), according to a Cabinet Office estimate Wednesday. Northwesterners should pay close attention to the tragedy unfolding in Japan because the same thing is headed our way, scientists say. Seattle Times science reporterRelief and dread mingled Friday across the Northwest after the monster earthquake and tsunami in Japan. Though at least one person was presumed drowned and several ports damaged in Northern California and Oregon, most of the region dodged damage from the waves. But the horrific images from Japan of pancaked buildings and ships, and homes and cars being swept away like scraps were a reminder that a quake and tsunami of the same size — or bigger — will strike here some day. "You have to be completely unaware not to look at this earthquake and ask yourself: What would Washington do if this was us?" said Tim Melbourne, an earthquake expert at Central Washington University. "This is really an eye-opener." The fault that ruptured off the coast of Japan is a shorter version of the Cascadia Subduction Zone that extends for 600 miles along the coasts of Washington, Oregon and California. Subduction zones are the places where geologic plates overlap, with one being forced beneath the other. Northwesterners should pay close attention to the tragedy unfolding in Japan, because the same thing is headed our way, scientists say. The massive earthquake that struck Thursday night, followed within minutes by tsunami waves 20 feet high or more, is almost identical to what the coast of the Pacific Northwest will see when the offshore fault called the Cascadia subduction zone ruptures. "It's the best example of what we're going to have, and I'm sure Japan is more prepared than we are," said John Vidale, head of the Pacific Northwest Seismic Network at the University of Washington. The Cascadia fault last ruptured in 1700, generating a magnitude 9 earthquake and a tsunami that may have been bigger than the one that battered Japan. Major earthquakes on the Cascadia fault occur every 400 to 500 years, though some new evidence suggest they could be much more frequent. Japan's extraordinary magnitude 8.9 quake is the fifth strongest recorded since 1900. Helping Japan recover and learn from this experience is part of understanding the risks and realities faced in the Puget Sound region. EVEN the painful videos that captured the 8.9 magnitude earthquake in Japan seem to go on forever. Images of the 23-foot tsunami wave rampaging ashore, and its debris-laden assault inland are even harder to watch. Japan's natural disaster is a human tragedy with a special kinship here in the Puget Sound region. The extraordinary loss of life, destruction and dislocation and economic havoc are heart rending. Awareness of our own vulnerability makes the scenes all the more disturbing. Vigorous waves similar to any stormy day on the coast were the only sign that a tsunami had arrived in Washington on Friday morning. The National Weather Service said the first wave of the tsunami to hit the Washington Coast just after 7 a.m. measured 1.7 feet at La Push, about half a foot at Neah Bay and Port Angeles, and 1.3 feet at Westport. The tsunami advisory remained in effect for the Washington Coast and more waves were expected, said Kirby Cook, science and operations officer for the National Weather Service in Seattle. More waves were landing in California and that meant Washington and Oregon could expect more as well. The advisory would remain in effect until the tsunami center in Alaska called it off, Cook said. The waves were triggered by an 8.9-magnitude earthquake in Japan. The tsunami warnings moved faster than the waves, giving millions of people across the Pacific hours to flee to higher ground. Now they are left to clean up what the waves had wrought: Destroyed docks and damaged boats. A deadly tsunami generated by an 8.9-magnitude earthquake in Japan raced across the Pacific on Friday and into marinas and harbors in Hawaii and on the West Coast, sending boats crashing into one another, carrying some out to sea and demolishing docks. The damage - the most severe in two seaside towns along the Oregon-California border - was estimated to be in the millions. A ferocious tsunami spawned by one of the largest earthquakes ever recorded slammed Japan's eastern coast Friday, killing hundreds of people as it swept away boats, cars and homes while widespread fires burned out of control. TOKYO – A ferocious tsunami spawned by one of the largest earthquakes ever recorded slammed Japan's eastern coast Friday, killing hundreds of people as it swept away boats, cars and homes while widespread fires burned out of control. Hours later, the tsunami hit Hawaii and warnings blanketed the Pacific, putting areas on alert as far away as South America, Canada, Alaska and the entire U.S. West Coast. In Japan, the area around a nuclear power plant in the northeast was evacuated after the reactor's cooling system failed. Police said 200 to 300 bodies were found in the northeastern coastal city of Sendai, the city in Miyagi prefecture (state) closest to the quake's epicenter. Another 110 were confirmed killed, with 350 people missing. Police also said 544 people were injured. The magnitude-8.9 offshore quake unleashed a 23-foot (seven-meter) tsunami and was followed by more than 50 aftershocks for hours, many of them of more than magnitude 6.0. -- The threat of a tsunami prompted the U.S. National Weather Service to issue a warning for at least 50 countries and territories after an 8.9-magnitude earthquake struck Japan Friday. Seattle sits on the type of ground that would amplify the effects of an earthquake. Scientists can't offer a firm prediction when the next one will happen...only the certainty that it will. Thanks to modern building codes and sound disaster insurance policies, the damage from Tuesday's devastating New Zealand earthquake was limited. New Zealanders have received a violent wake-up call: It's past time to be prepared for the "Big One" – the long-feared major earthquake authorities have been warning about for years. As this small island nation picks up the pieces from the 6.3-magnitude earthquake that walloped its second-largest city, Christchurch, leaving scores dead and hundreds of people still trapped, officials are set once again to assess whether routinely dire warnings have yet led to the hoped-for sea change in the nation's preparedness. Local building regulations in place since the mid-2000s appear to have served the city well, according to Graeme Beattie, a structural engineer in Christchurch this week to look at the seismic response of structures. When large earthquakes happen in other areas of the world, SCEC is often asked questions such as, "What would the damage have been if it had happened in southern California?" or, "Why was there so much damage (in the other area) even though the magnitude of the earthquake was not that large?" After the recent earthquake in Washington state, SCEC was asked an unusual question: "Why was the damage in the Washington so much less than the damage caused by the 1994 Northridge earthquake, when their magnitudes were so similar-- 6.8 vs. 6.7?" This article presents a comparison of the geological aspects of the two earthquakes, which account for most of the differences in resulting damage. Slide crop from "Seattle Fault Scenario"
SEATTLE, February 22, 2011— On the ten year anniversary of the Nisqually earthquake, the American Red Cross encourages Western Washington residents to evaluate their own personal earthquake preparedness and take steps to plan for a disaster. 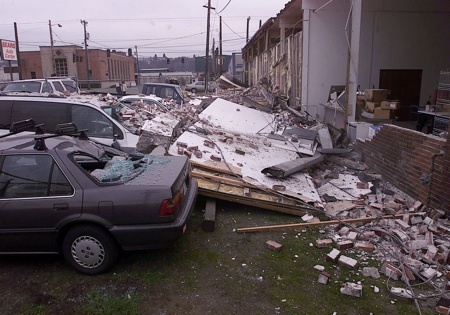 Ten years ago on February 28th, Washington State was struck by the 6.8 Nisqually Earthquake. This earthquake was centered 30 miles southwest of Seattle between Olympia and Tacoma. The American Red Cross responded immediately and provided assistance to 200 families in Western Washington. In response to the earthquake, the Red Cross established seven disaster relief supply centers around King county and additional one in Kitsap county. These Red Cross supply centers allow emergency supplies to be pre-positioned for use in future disasters and can be transported to emergency shelters. In addition, the Red Cross has provided disaster education for thousands of Western Washington residents in the past ten years. Become aware of fire evacuation and earthquake plans for all of the buildings you occupy regularly. Practice drop, cover and hold on in each safe place. If you do not have sturdy furniture to hold on to, sit on the floor next to an interior wall and cover your head and neck with your arms. Keep a flashlight and sturdy shoes by each person’s bed. Install strong latches or bolts on cabinets. Large or heavy Learn how to shut off the gas valves in your home and keep a wrench handy for that purpose. Keep and maintain an emergency supplies kit in an easy-to- access location. Have an out of area contact because local lines can be difficult to access during a disaster. During a disaster, family members can call the contact person from out of state to report on their own status and check on others. A SMS text messages from a wireless communication device will often work if even if a cellular signal is not strong enough to make a voice call. To learn about what do during or after an earthquake please go to www.seattleredcross.org or www.redcrosswashington.org. For more information or to set up a disaster preparedness presentation for a community group, contact us at (206) 709-4528 in King County or (360) 377-3761 in Kitsap County. The American Red Cross is a non-profit, humanitarian agency dedicated to helping make families and communities safer at home and around the world. For more information, visit www.seattleredcross.org. The earthquake in Chile is getting a lot of attention in the Pacific Northwest because the seismic zone and the building methods in Chile are strikingly similar to what we have here. The quake hit Christchurch, New Zealand, a city comparable in size to Spokane, along a fault-line that was unknown until last September. 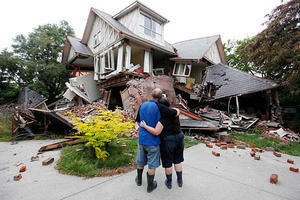 That's when an even larger quake hit New Zealand -- but with limited damage, since it was centered farther from any city. Authorities in Christchurch were predicting the death-toll would rise to 300. In recent years, scientists have found evidence of shallow faults across the northwest, such as the Seattle fault that runs beneath Qwest Field and roughly follows Interstate-90. "In fact, there’s sort of one per town," says John Vidale, a professor at the University of Washington and director of the Pacific Northwest Seismic Network. "There’s the Tacoma fault, there's the Olympia fault, there's the Portland hills fault, there's the south Whidbey fault, which runs up the east side of the Puget Sound." In the decade since the Nisqually earthquake shook buildings, rattled nerves and rolled the ground in Western Washington, the level of seismic danger in the Pacific Northwest hasn’t changed. But scientific ideas about the danger have evolved and the ability to study and prepare for it has improved immensely. Scientists from the University of Washington and the U.S. Geological Survey have increased their knowledge about the three different types of non-volcanic earthquakes that occur in the Northwest, and are learning how unfelt “episodic tremor and slip” events relate to seismic risk. The number of seismic sensors and the territory they monitor has tripled. Engineering standards have improved to meet the region’s seismic risks. Ten years after the Nisqually earthquake delivered a gut punch to our complacency, we've repaired the damage, built fire stations that won't collapse, made freeway bridges more robust, and strengthened a courthouse and the region's major trauma hospital. Yet thousands of homes, offices, apartments, shops and hospitals have yet to be bolstered, and for many emergency planners, progress has been agonizingly slow. There's no mystery about what needs to be done. What's lacking is money, a sense of urgency and a carrot or a stick to motivate private property owners. Experts point to last week's deadly quake in New Zealand as a reminder of what could happen here. A quake on the Seattle Fault would bring a similar type of shaking — and quite likely more powerful — along a line that slices through Seattle, Mercer Island and Bellevue, beneath a mix of old and new structures. A decade ago, scientists knew Western Washington was vulnerable to much nastier shakes than the magnitude 6.8 that rattled Seattle on Feb. 28, 2001. But it's what they've learned in the last 10 years since the Nisqually earthquake that really has some researchers spooked. Why was the Magnitude 6.3 New Zealand Earthquake so Destructive? LOS ANGELES – The latest New Zealand earthquake was a deadly combination of distance, depth and timing. While weaker than the one that rocked the area last September, it did more damage and cost lives, primarily because of its location. Tuesday's magnitude-6.3 quake was centered about 3 miles from the populated hub of Christchurch, toppling buildings, killing dozens and trapping others. It was also only about 3 miles deep and occurred during the middle of a workday when commercial buildings were filled with employees. SYDNEY, Australia — A powerful earthquake struck Christchurch, New Zealand, during the city’s busy lunchtime rush on Tuesday, flattening office buildings, destroying several homes and killing scores of people, officials and eyewitnesses said. A woman was rescued from a building after an earthquake in Christchurch, New Zealand, on Tuesday. An aerial view of a damaged cathedral in Christchurch, New Zealand. Fault line, won't you be my Valentine? The second largest earthquake since Mount St. Helens erupted -- a magnitude 4.3 shaker -- rocked a fault line six miles north of the volcano Monday morning. People felt it as far away as Astoria, Lake Oswego, Hood River and even Bremerton, Wash., near Seattle. The last one, as it happens, was 30 years ago also on Valentine's Day, a magnitude 5.5 temblor. A magnitude 4.2 earthquake rattled many residents in the south Puget Sound area. The Washington Transportation Department inspected four or five bridges in east King County as a precaution because of the Tuesday morning earthquake in the Duvall-Carnation area. The City of Seattle also inspected key structures. Puget Sound's infrastructure, both buildings and social systems, should help it fare well in the face of the earthquake risk it faces in the next decades. But these guest columnists, board members of the Cascadia Region Earthquake Workgroup, urge the region not to be complacent. One of the best parts of being a retrofit contractor is the satisfaction that comes from helping protect and preserve Seattle's vintage architecture. In July of 2017, Sound Seismic owner Leif Jackson had the privilege of submitting a bid to reinforce what might be the oldest house in the city. The West Seattle home is said to have been built in 1864 by pioneer Doc Maynard. It was moved from its original location in 1915, and looks quite different now, thanks to a number of remodels. Still, the home is pretty special. The floor framing is hand-hewn douglas fir logs, complete with bark. Supporting posts were constructed with 12" x 12" old growth lumber, dwarfing the occasional more recent 4x4. While Sound Seismic may not get to retrofit this house - post-and-pier homes are not the best candidates for retrofitting - just getting to see it was quite an experience. "I can honestly say that, in over 18 years of retrofitting in Seattle, I have never seen a house quite like this", said Jackson. Mary Ellen and I are both extremely pleased with the work that your crew did. Please pass on my personal "thank you" to each of them. We were pleased with the amount of clean-up that was done at the end of each day. Even with your discovery of unforeseen conditions that necessitated additional framing, it was still done within a very reasonable time-frame. My overall experience with Sound Seismic has been very positive and we will recommend your services to our circle of friends and family. Again, thank you for a very "enjoyable" experience! I wish to praise SOUND SEISMIC for the earthquake retrofit they completed on my home. From the estimate to the finished job, Leif and his crew were professional, hard working, pleasant and exceptionally CLEAN. They handled the permit and inspections seamlessly. Office support from Elizabeth was equally professional, reliable and fast. I can't describe everything so I'll just say the whole experience was great. Sound Seismic was professional and they came when they said they were going to come. They came early and they called me to ask if it was okay to start the work earlier. They explained everything to me. It seemed like a reasonable price for the work because I had read other people’s descriptions on retrofitting on Angies list. The price seemed right in line with what I was expecting. We recently had Sound Seismic do our earthquake retrofit. I cannot compliment enough the very professional job they did. Leif Jackson, the owner, sat with us for two hours answering questions and explaining how earthquakes work. He was completely above board, not promising more than he could deliver. He left interesting reading material so that we could evaluate and decide for ourselves. The most compelling was from FEMA warning people in the Puget Sound area to do everything they could to protect their homes because of our earthquake risk. Once we were in contract, Leif sent our information to a structural engineer who drew up the plans. The bid was fair and complete. The crew showed up on the date the job started and completely it quickly. It looks great. Our new pony walls are gorgeous and the bolts and clamps very reassuring. City inspections were completed for the bolting and then for the finished job. This company is certified and high quality. Our house will be sticking around on the foundation. I encourage you to get over gambling about retrofitting and hire these guys. They are great. The crew kept me informed of their progress and plans all the time. They told me what their plans were, and delivered every time. Very satisfying knowing I could count on them doing what they promised - when they promised it! My experience with Sound Seismic was very good. They were upfront about the work that needed to be done, about the cost and about the specific changes that would be required. In general, they had a high level of professionalism. They were on schedule, did a good job and cleaned up afterwards. They actually returned calls, which seems to be rare with contractors. I haven’t had other work of this sort done before. They did a really good job overall. They were very good about scheduling and estimates, and did quality work. They were one of the few providers in the area who would do the work - I thought the price was reasonable. I would use them again in the future. Sound Seismic was the most professional group of contractors/employees I have ever dealt with. They were knowledgable, dependable, and skilled. The project lead was obviously well trained and knew what he was doing, was able to effectively manage and direct his crew and subcontractors. A quality job. Discovered an area behind my walls were my house was not up to code. Worked well will me to correct the problem and professional and reasonable about the change order. The Sound Seismic crew arrived on time and got started on this structurally engineered and contracted job. It was estimated to take approximately one week to complete this work. The job was completed in 4 days with great professionalism and dedication to the work completed. The work passed a city inspection with no additional work required. The quality of work is excellent with great attention to detail. Based in Ballard, the 2 man crew of Sound Seismic did a very clean, professional job of installing the earthquake retrofit. I was very happy with quality of the work and the way the crew kept the site clean and organized every day. They stick to a firm 8-hour work day for their employees and offer health benefits, a rarity in the contract world, it would seem. So their bid was not the lowest, however was comparable to a number of other firms, within 5-10%. Very punctual and professional in all coordination and in handling the 2 inspections reqd. by the city. No surprises or additional costs. I would recommend this contractor overall. Sound Seismic did such a thorough job. Looking at their work lets me sleep better at night knowing my house is now very unlikely to shift off its foundations in an earthquake. We thank you for the very professional work done by all of your people that we have had contact with. The crew working here were outstanding, and we were charmed by your lead carpenter, Matt. Our basement has not been this clean in 70 years (the house is 70 years old)! We had a wonderful experience with Sound Seismic. After the devastating earthquake in Japan my husband and I were quite worried about our 3 story brick home and decided to retrofit our basement as a way to ease our anxiety and protect our family. Sound Seismic's estimate was more reasonable than any of the others we got and we felt very confident knowing that Leif and his team have done many retrofits, including our friend's basement. Leif was able to explain the process to me, answer my questions, and gave me the estimate within an hour of coming to the house. The hardest part of the process was moving our furniture and boxes out of the way to prepare the basement - after that things just moved along smoothly. I had been expecting huge holes in the walls and dust everywhere but the work was really tidy and not nearly as disruptive as I had feared. My kids and I were able to stay in the house the whole time, only playing out in the backyard a couple times when the banging was loud. The baby was even able to take naps in the midst of the demolition! Matt was very professional and friendly, he always arrived on time and he communicated well, checking in with us at the end of each day to show us the progress of the work. He was able to finish the work a half-day sooner than planned and there were no hidden costs or extra changes when the invoice arrived. I would highly recommend Sound Seismic to anyone -- they were fantastic! Thanks for the great work on the house - you've done an outstanding job of prompt, low-impact work - and leaving the job site in excellent shape. Appreciate the attention to detail." "I wanted to follow up and thank you for your good communication, strong planning and flexibility. Your foreman was great. Very professional, low key, friendly and efficient." They did an excellent job. The whole experience from start to finish was excellent. When they came out they told us what would need to be done, how it would be done and how much it would cost. We set a date and they came. They did the work exactly as they said they would. There were no surprises. The communication with the contractor throughout the process was excellent. The crewmember that came out to do the work did a fantastic job of cleanup afterwards. It was just excellent from start to finish. Because of the work they did we were able to get earthquake insurance, which we had not been able to qualify for previously. We would use them again and we would recommend them to any of our friends. Sound Seismic gave a very competitive bid, clearly explained everything they were going to do, accomodated my schedule, and produced a very high quality outcome. I highly recommend them. They took extra care at every level: and left everything better than ever. They were able to remove the siding without cutting it, which is great, too. I am very happy with all aspects of the plan and the work, Leif. All in all, we felt the project went extremely well. Given the number of earthquakes worldwide of late, we are pleased to have had the work done. We’d rather not have it tested, but we know we are in as good a position as possible if the ground starts shaking! I wanted to let you know what a great job that your crew did on our earthquake retrofit. They were very knowledgeable about the whole process and answered any questions we had without hesitation. Their work was excellent and they finished the job quickly. I have done my share of remodeling in the past and I can say that they cleaned up after each day’s work more thoroughly than anyone I’ve ever encountered. They took obvious pride in the retrofit work they did but also in the cleanup. They saw that as an integral part of the Sound Seismic service. All in all, it was a fast and painless experience. Thanks for assigning those fine young men to our job. Sound Seismic performed an engineered retrofit on our house built in 1928. I've never had a better experience working with a contractor - thoroughly professional (truly experienced and knowledgeable in their craft), they were also excellent communicators throughout the engagement. And the cleanup afterwards was amazing. I would recommend them without reservation! I wanted to thank you for the wonderful job you did retrofitting my home in South Seattle. I was aware that it would be a challenge and it proved to offer more problems than we expected. You met them all and did a great job correcting the rot and damage that happened over the years since 1927, when the house was built. When I arrived home yesterday the basement was clean and organized. It was the first time I did not have to spend hours cleaning up after a contractor. Your lead carpenter and his assistant were a great team. Thanks for all your efforts. I can't think of a single way you could improve the service of your company. Yours is one of the VERY best companies I've worked with on this home. Sound Seismic completed a earthquake retrofit on our house. Their explanation about what to expect and what we'd get was clear and straightforward; the work was completed as described, as scheduled and exactly on time; clean-up: spotless. "The experience with Sound Seismic was possibly the finest I have had in my dealings with any of my trade contractors. Your crew was knowledgable, well informed, hard working, tidy, as well as a pleasure to have on my job." Thank you very much for your excellent work on retrofitting our house. We appreciated your careful oversight of the project, ongoing contact with the engineering firm, attention to detail, and clean and timely work. You really rose to the challenges presented by "this old house." Sound Seismic exhibited a great combination of skill, hard work, and professionalism. You treated our home and our project as though you were doing it on your own house. Everything looks good. Thanks for the all the work your guys did, very professional. Sound Seismic did an excellent job of the seismic retrofit on my two-story house, which entailed quite a lot of siding work as I don't have a basement. The workmen were punctual, neat and meticulous. I feel safer because of their work.